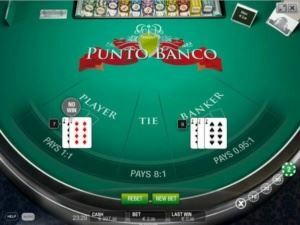 Online Baccarat, also known as Punto Banco, Baccarat Chemin de fer or Baccarat Banque, is a card game that sees Australian players compete to get the winning hand. This hand will consist of two or three playing cards and the winning hand is the one that has a value of 9, or as close as possible. The game has plenty to offer all Australian players and regardless of what era you’re talking about, there are few casino games that can match Baccarat. If you take into consideration the games placed on top Australian Baccarat casinos, the thrill and excitement are magnified tenfold! These are some of the best Online Casinos Australia where you can play Online Baccarat. On the surface, it’s a card game with rules that naturally vary depending on exactly which variant you’re playing. There are three main variants of Baccarat, not counting the other versions individual companies have created. The first is called Punto Banco and is a game of chance with no strategy involved and, as a result, is great for beginning players. Baccarat chemin de fer and Baccarat Banque, however, elevate things to the next level and allow the skill of the player to play a significant role in the outcome of each hand. Beneath that traditional exterior, however, is one of the most popular card games ever created. Baccarat was even the game of choice of Ian Flemings’ super spy, James Bond. 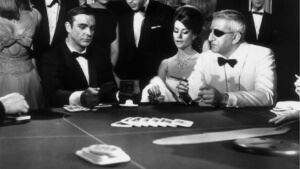 While 007 no doubt helped to elevate Baccarat’s status, it was a very popular card game long before the world had heard of Mr. Bond. Ever since its inception it has been known as the game of kings and now, thanks to casinos around the world, you can enjoy it as well. In the 21st century, you can enjoy Baccarat from the comfort of your own home at countless online casinos in Australia. While the exact origin of the game is unknown, it is believed to have originated in Italy during the Medieval Ages. The name itself means ‘zero’ in Italian and in the 15th century, war broke out between Italy and France. It is believed that the French were exposed to the game during the conflict and it was introduced to France. However, it didn’t catch on right away and took several centuries before it started to gain popularity. By the time it started to get popular, there were already several different versions, Chemin De Fer become popular with the upper class, while Punto Banco was popular with the lower classes and eventually made its way to England and America. 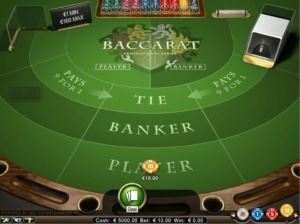 Online Baccarat is played very similarly to traditional Baccarat in many respects. The core game itself is still played between two hands – one representing the player him or herself and the other representing the banker. 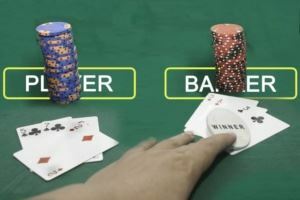 Each round in the game still has three distinct outcomes depending on how the cards fall – the player can have the higher score, the banker can have the higher score, or there can be a tie and those are the only three outcomes. 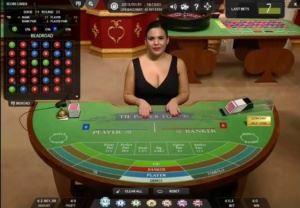 What really elevates online Baccarat into a game all unto itself, however, is the way that the player now has complete control over their environment. Your brain and the strategy that you’re putting together no longer has to compete with hundreds (and in certain cases thousands) of other players and the noise that they’re creating like you would have to deal with in a neighbourhood casino. You no longer have to worry about taking too long to make a move or about the countless distractions in the world around you. The environment can be as loud or as quiet as you want it, which goes a long way towards not only creating a much more enjoyable experience but also allowing you to really revel in the skill of it all. 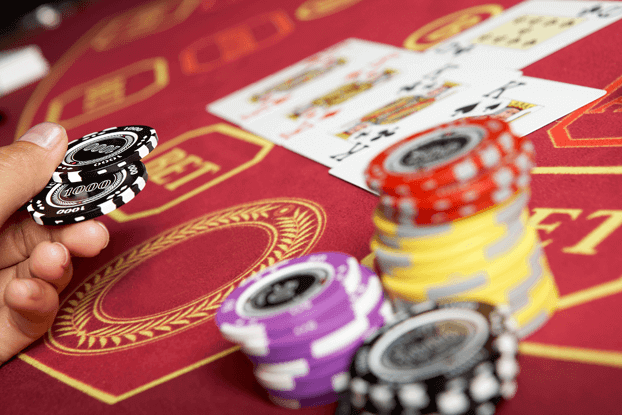 Internet gaming software giant Microgaming has released three different variations of Online Baccarat, many of which are available at casinos operating all over the Internet, and Australia is no exception to the rule. 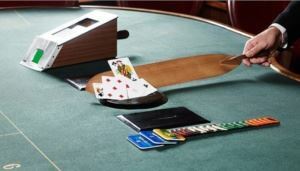 The first of those is traditional Online Baccarat, which contains a deck of 52 cards. The game is also played on a Mini Table, which is the primary feature that helps separate it from the other variants. 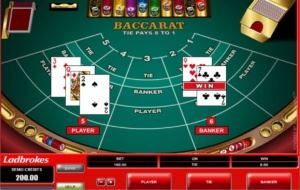 The second major version of Online Baccarat that Microgaming is responsible for is called High Limit Baccarat. As its name suggests, it allows for higher betting limits than the basic version. It is also played with eight decks of 52 cards on the same Mini Table, as opposed to the single deck that is used in the traditional game. Though hands are dealt face down, the player always has the option to “peek” at their cards in this setting before dealing any additional cards at any time. The third major Online Baccarat game offered by Microgaming (and the most advanced) is called Baccarat Gold. 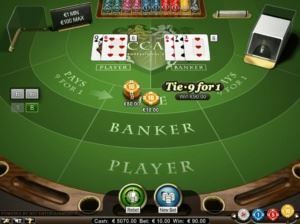 This version of the game is played on a full-sized table, despite the fact that most online casinos offer it in a single player format. The graphics in this version are also noticeably the most advanced, which goes a long way towards recreating the feel of a neighbourhood casino in the comfort of your home. Many new players often wonder if they’ll be able to play Online Baccarat for free, before spending real money on the game. The good news is that there are countless Online Casinos that will allow players to play for free, giving you the opportunity to get familiar with the game and decide if you enjoy it before you actually start spending real money on the game. Even after you’ve created an account and started playing for money, you’ll be able to switch back and play for free to try out a new strategy or just to play for fun. If you want to make the most of your online Baccarat experience, the first thing you should do is find a casino with the Microgaming logo. The company really has a knack for creating great casino table games and, in most cases, their Australian casino games are either on par or better than other providers like Playtech due to the high demand for the game in this country. You should also investigate the security features at the casino to help make sure that all of your important and private financial payment information stays protected at all times. Make sure you’re familiar with the rules before you start playing. 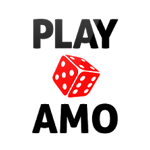 You can play for free beforehand in order to learn the game. Try and have a good understanding of the odds. There are only three bets you can place, do some research on each of these. Pick the game with as few decks as possible. From a sheer statistical standpoint, playing the basic version of the game will allow you to win most often. However, you’ll also have to contend with lower betting limits. This means that even though you may win less often in higher stakes online Baccarat games, you may actually win more money. You’ll also want to consider betting on the banker in many situations, as this is the bet in all versions of the game with the lowest edge towards the house. We’d advise against betting on a tie. While they do happen and the payout is 9:1, they are quite rare and you’ll most likely just land up losing money. Set a budget and stick to it, don’t chase your losses no matter what. If things aren’t going well, just walk away. 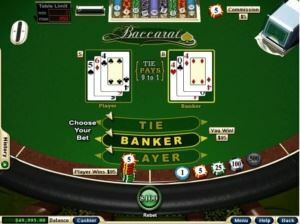 Mini Baccarat – A version of the game that is normally found at an online casino, using a smaller table with lower stakes. Commission – This is the amount of money taken from the player who wins after placing a Banker Bet, also known as ‘vigorish’. 10, Jack, Queen and King = 0. 2 to 9 = Cards face value. The cards are simply added together to get the final score. When it comes to cards that have a value over ten, the ‘ten digit’ is removed to reach the score. The worst possible hand equals Zero and is known as Baccarat. The game is normally played with six decks and is reshuffled after every hand. The player’s hand will be dealt first and if it equals between zero and five, they will draw another card. 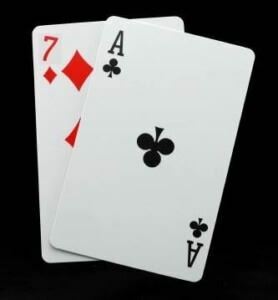 If the Banker’s hand totals seven, eight or nine, another card is not drawn, but if it totals zero, one or two, the banker will draw another card. Baccarat is the type of card game that truly has it all. The basic versions are easy enough for novices to pick up and the most advanced games are the type of adrenaline-filled thrill rides that more seasoned veterans can’t get enough of. With many different Microgaming-powered variations available in online casinos all over Australia, you don’t even have to leave your house anymore to have the time of your life. Baccarat is a game that is quite similar to Blackjack and is one of the oldest known gambling games in existence. While it may be very old, it is still extremely fun to play and really easy to learn. This helps to ensure that there are always new players getting into the game. If someone else has a better hand, can I bet on that instead of my own? Yes, you can. One thing that many people incorrectly believe is that you can only bet on your own hand. This is not the case and if you feel the banker’s hand has a better chance of winning, you’ll be able to put money on it. At the end of the game, all that matter is which hand had a value closer to nine. So, make your choice, have fun and win. Is the payout the same if I bet on the Banker’s hand? Thankfully the payout is exactly the same. Whether you bet AU$10 on your own hand or AU$10 on the Banker’s hand, you’ll win AU$10 if the hand is the winner. The only slight downside is that there is a small commission that you will have to pay whenever you win while betting on the Banker’s hand. 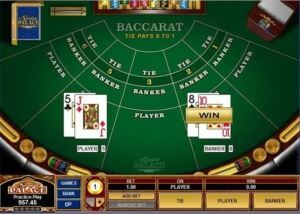 Is it possible to play Online Baccarat for free? Absolutely, there are many Online Casinos that allow players to play without spending any real money. 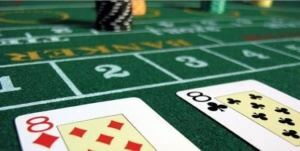 The casinos will typically offer a wide variety of games that can be played for free, including pokies and table games. This is fantastic news for players who are new to a particular game, as it gives them time to get familiar with the rules and how to play, without risking their money yet. Once a player has decided they understand and enjoy the game, then they can go ahead and start playing with real money. How do I know if I have a good hand in Baccarat or not? Well, the first thing you need to do is understand the objective and the rules. The objective is to get your hand’s value to be nine, or as close as possible. Nine is also the maximum value of a hand. If your hand has a value of 16 for example, the ten is dropped and your hand then has a value of six. How are cards valued in Baccarat? Cards are valued differently to how they are in similar games, like Blackjack. In Baccarat a 10, Jack, Queen and King all have a value of zero, while Aces are worth one. The rest of the cards are worth their face value, so a seven of hearts is worth seven.